Kevin Cuthbert saved the penalty that took Hamilton to the Premier League. He was named man of the match in a Hampden semi-final with Ayr United. He also lifted the Challenge Cup with his home-town club St Johnstone. But his favourite time in football ... the three weeks in caretaker charge of Raith Rovers. “That’s what I look back on with the most joy and pride,” he said. “I got up every day, looking forward to going in. “On my very first day I spoke to the players for half an hour. “Having never done it before, I felt it was an environment I thrived in. “And as much as results and performances weren’t great, the players gave me everything, and I absolutely loved it. It’s clear the disappointment at failing to land the manager’s job on a permanent basis remains with Cuthbert as he reflects passionately on his time with the Kirkcaldy club. “When I first went there, I felt as if Grant Murray had the club on a good route,” the former goalkeeper said. “He’d taken the club from part-time to full-time, to a great training facility, and maybe he didn’t push the top four in the Championship, but I just felt the club in general was going in the right direction. Cuthbert’s frustration surrounds what he perceived to be the lack of an overall strategy at the club. 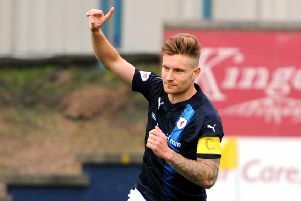 Based on his time at Hamilton and St Johnstone, clubs who have punched above their weight for a number of years, he is a firm believer that Raith should adopt a similar long-term strategy, rather than chasing different goals from season-to-season. “I always quote my Hamilton days because they had a plan in place,” he said. “They didn’t bother about short-term, everything was long-term. “Raith is a club that is no different to St Johnstone, Hamilton and St Mirren in terms of fan base, potential, stadium – everything about it. “But for 20-odd years they’ve been below the Premier League, so that suggests something’s not right. “The club’s immediate goal is to get out of League One, and I get that, but they were in Championship for five or six years before that, and where did it get them? “It got them relegated with no structure in place and a club that has gone backwards. “That’s not any individual’s fault – not John Hughes, Gary Locke, Eric Drysdale, Alan Young, or whoever. It’s because there’s no structure in place. “Realistically, if they get promoted, and they will at some point, what is the goal once they get there? “Is it to fight for seventh or eighth? Or is it to try to build a squad over time, which evolves into a team that can be challenging at the top of the league to get promoted. “When I was at St Johnstone, a lot of the time it was trying to get young players through, then once that foundation was there, the goal changed to, we want to get promoted. “Now they are top six club that bring through one or two youth players, but ultimately they are a team competing at the top end of league. “The biggest frustration I had at Raith was that everything was a short-term target. “We need to get promoted. Why? We’ve got nothing in place to help us when we get there. “It’s difficult because the fans expect promotion, but if you come out to supporters and say, over the next five years, we may not neccesarily be where we should be, but we’re going to get to a place where we want to be, which is bringing through youth. “That takes a strong board to say, bear with us, we’re going to build something. “I wrote a plan for the club a few years ago and without even having a proper youth system in place, you could have had a team based on Ross Laidlaw, David Bates, Sean Mackie, Ross Callachan, Ross Matthews, Lewis Vaughan – all guys who were coming through. Cuthbert pointed to the sale of Sean Mackie to Hibs in 2016 for a nominal fee before he had even broke into the Raith first team as an example of the club’s short-term thinking. “He hadn’t played a game for us but he was in our youth system, and had great potential,” he said. “I know the conversation was, ‘let’s sell him to sign Joel Thomas and Ryan Hardie’ – short-term thinking. “If I’m Ray McKinnon that’s what I’m doing because I need to finish fourth. “But if somebody above that is saying, you know what, no, we could get £250k for him if plays 150 games for us. “That’s no criticism of anyone on the board at the time, but the short-term goal was to finish fourth, and there was no longer term goal underneath that. “Ray is a phenomenal coach, one of the best in Scotland, but his sole focus was on the first team, and you can’t blame him. “It’s not as if someone could say, ‘Ray, our plan is this’, because there was no plan. “Sean was an asset for the club to keep but they ended up losing him for pittance. “Hamilton manage to keep them, get them under contract, and sell them. They don’t get done. “Raith Rovers, and clubs in Scotland in general, leave money on the table because they’re only looking at short-term goals. Cuthbert believes that adopting a firm strategy, and sticking to it, can help the club avoid another Gary Locke situation, where a manager, in chasing short-term goals, signs players on big wages, such as Jean-Yves M’voto and Rudi Skacel, at the expense of home-grown talent. “Gary Locke’s expectations when he came in was that we were going to win the league,” Cuthbert said. “With the best will in the world, there was no chance we were ever going to do that. “Half of Ray’s team was away, and Gary tried to replace those players, but the guys he brought in weren’t good enough. “They weren’t the right characters, and they didn’t do well enough for the team. “Gary would have looked at that team and thought he can’t take the chance to build a squad over two years, because if he doesn’t get it right in the first year, he’ll probably get sacked. “Unless the club are frank and say we’re not going to win the league, and aim to finish mid-table, but get the likes of David Bates, Ross Callachan, Lewis Vaughan and Ross Matthews 50 games under their belt. Cuthbert was keen to stress, however, that he shared the responsiblity for the clubs failures over the time he was there. “I contributed as much as anybody to relegation,” he said. “I didn’t play as well as I did the season before, made mistakes in games and cost us points. Cuthbert is hoping his chance in management has not passed him by. “I have to be realistic – my CV reads a 5-0 defeat and two draws!” he said. “One thing anyone can can see is my passion and love for football. “I looked at Raith as a project and something I could build up – I’d love to get that chance at another club.